Richard started training in November of 1992. His hard work and respect was quickly recognized by Sensei Kiel. Under Sensei Kiel's guidance, Richard became an outstanding student and competitor. He has competed at the local, state and national levels. At the ISKF national tournament in 1994, Richard received a bronze medal in team kata with his brothers Josh and Steven. In July 1995, Richard received his shodan under Sensei Yaguchi. And in October of 1997, Richard was a three time gold medalist at the Windy City 5 Traditional Karate Championship. In February 1998, Richard received his nidan under Sensei Kiel. Richard went onto earn his sandan and yondan under Sensei Kiel. During his time in college at St. 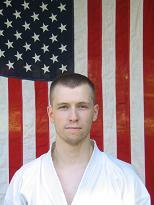 Cloud State University, he organized and was the lead instructor for the Shotokan Karate Club. In addition, he also taught for a brief period in Spicer, MN. In September 2002, Richard traveled back to the Windy City 10 Traditional Karate Championship where he place second in men's black belt kumite and took home the gold in team kata with his brother Josh and Sensei Kiel. Today Richard lives and trains in the St. Cloud area. His spirit and knowledge of the art has made him a great practioner and teacher.